Urban / Precinct Management (UIP/MA) is gaining traction at a provincial level as expressed in this Mercury newspaper article. Capturing a session hosted by SAPOA, the KZN Deputy Director General for Planning was presented the Provincial Growth Plan, in which repeated reference was made to the success of Municipal / Private Sector precinct management structures (UIP/MA) in eThekwini and KDM. 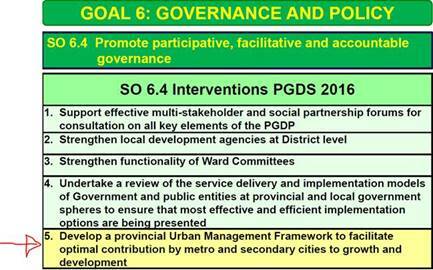 Based on this success ‘urban management’ has been included in the Provincial Development Plan under Goal 6.